ಹಿಂಗ್ಯಾಕೆ? : Think Small For Better Cities! Think Small For Better Cities! ‘Think small’ should be the new Mantra in the era of rapid urbanisation. Residents of Mandur successfully protested against the dumping of garbage generated from the Bruhat Bengaluru Mahanagara Palike. When almost all the governments promote urbanisation, when we the people flood to cities in the name of job, future, success it’s absurd to put the entire blame on the government for mishandling the waste generated in thousands of tonnes per day in Bengaluru. Though the plastic waste is difficult to manage in individual home setup (what we can do best is to reduce the use of plastic covers wherever possible) wet waste / kitchen waste can be handled effectively in home. Che Guevera is my inspiration for life. That inspiration led me to read more and more about Cuba. While reading many articles about Cuba urban farming/city farms ignited my interest. Cuba initiated city farming because of acute shortage of vegetables and eatables after the fall of Soviet Union and trade ban from America. That ignited interest was further inspired by Organic Terrace Gardening facebook group which actively discusses pros and cons of terrace / balcony gardening. At present Bengalurians are most active in terrace gardening. With all those ignition and inspiration i started to compost the kitchen waste through simple aerobic composting in plastic tubs and containers. It was smelly, too dry, too wet, too many magots in the initial days which was quite worrisome. Nature has many ways of correcting our mistakes and gradually i am learning the nature’s way of composting – combine carbon with nitrogen. It’s been a year since i threw wet waste into the garbage van! All those kitchen waste are happily nourishing the plants of our home. 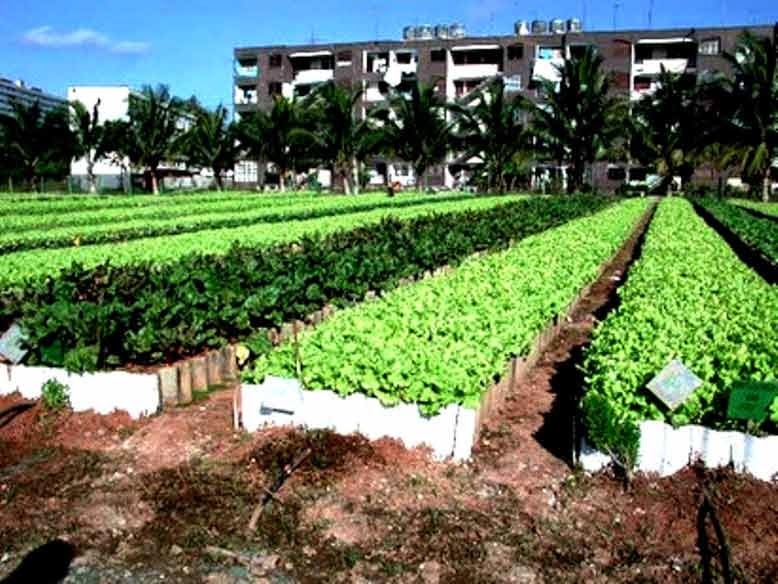 Urban farm in Havana, Cuba. When we shifted to this present house with full terrace for our use there were two options. First option was to buy the containers, soil, cocopeat, compost at once and fill the terrace with plants; quite easier. Second option to create the compost gradually from kitchen and growing garden’s waste, use the trash in home to create or innovate the containers and later buy containers as and when amount of compost increases. Absence of financial restrain tempted me to go with first option so that i can see everything green in a month’s time but my experimental mind made me to select the time consuming second option! Ideally we should have small pockets of places for human dwelling so that waste management won’t become troublesome. When the government and we, the people are more inclined towards ‘bigger’ ‘smart’ ‘greenless’ cities amount of waste generated will be proportionately big; Huge enough to spoil the health of an entire village which are near to the ‘big’ cities. While it’s almost impossible for most of us to leave the cities and move to countryside we can atleast do our bit to protect the health of countryside. A container in our balcony/terrace to compost the kitchen waste mixed with dried leaves might appear small, but the benefits it does to the environment is enormous. Think small, save environment. There are plenty of sites which guide us to terrace gardening, this is a tiny attempt from my side to share my experiences with simple and almost inexpensive methods to create a garden. My main aim is to avoid kitchen waste’s travelling into a distant village. Suggestions and full articles from the readers are welcome in both English and Kannada.